First Time Radiator/Fans Placement in Cosmos SE case? Just bought Cosmos SE from Cooler Master and as suggested here by their representative I bought the Cooler Master Seidon 240M water cooling for my new rig. Well after ordering it I thought for a while and just realized that the only two options for my 240m are top and front. Obviously the best would be front, but because of the bad design of Cosmos SE this requires removing of the hard drives rack which is something I try to avoid. So I guess it leaves me with no options at all, but top. Now after having a good thought about this, I realized why every review and comment I've read about Comsos SE mentioned how stupid the front design is. Very very bad design. I mean, why should I remove all of the hard drive rack in order to install a 240 radiator in front?? Bottom hard drive racks are very difficult to use, that space could have been used for a 240 radiator fit. Anyway, I'm terribly disappointing by Cooler Master as their loyal fan for years. If I could, I would replace the case for something else at this instant, but the damage has already been done. Now I guess I should find a way to make the best out of it. So is it worth it to sacrifice the hard drive rack in order to install the 240 in front or should I go with the top spot? If going for top, the dilemma would be how to set the fans for the top fans? - If I set them to exhaust, they will remove hot air from the case, but will heat up the radiator. - And If I set them to intake, they should cool down the radiator, but will blow down the hot air from it back inside the case. Also other fans would be important as well. I will be cooling down a i7 4770k and a Saphire HD 7870 in there. 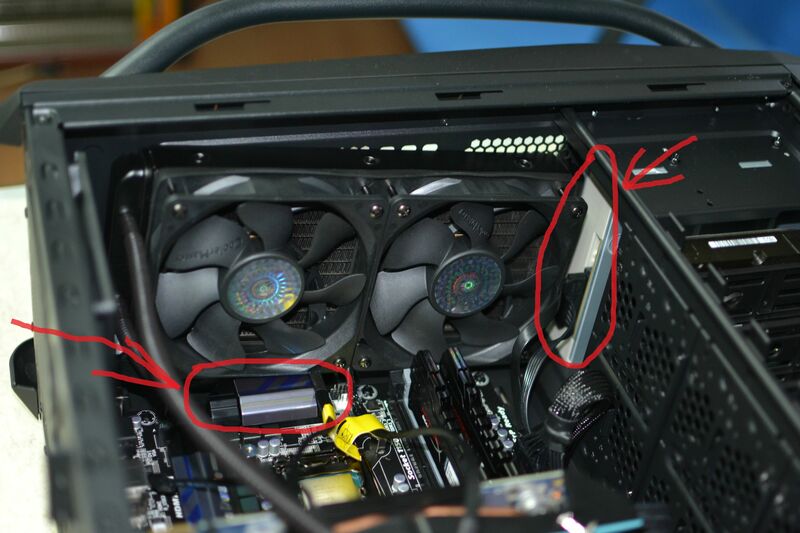 Here's a picture of the case and the fans placement. The problem is whether I should set the top fans for intake or exhaust? I'l admit when I first saw the Cosmos SE I was wondering what they were doing releasing a "full tower" chassis in their flagship series with such poor water-cooling support. Its easily outclassed by far cheaper cases and doesn't even look that good. You want the rad on top of the case. Its true that it will receive warmer air from the rest of your system and your CPU temps will suffer as a result (though not by much if you have sufficient intake airflow), its better than losing the HDD cages and then having the heat dumped back into the case for your GPU and mobo to deal with. What made me choose the Cosmos SE and even made me rush into getting it without thinking twice was my experience with the Comsos II. When I saw Cosmos II I thought it was built great, has it's design flaws, but the quality in doors and overall build quality is superior. Then I thought Cosmos SE should be the same only smaller. I was terribly wrong! Only the name is the same and those handles which are cool by the way. Nothing else. Everything else on the Cosmos SE is the same as any other two classes lower case. That's what I call a good marketing success good one Cooler Master. Anyway, thanks for the suggestion @manofchalk. Just one quesiton, do I put the fans on the the radiator to intake or exhaust ? I apologize for trouble with the Cosmos SE. When you say damage, what part are you referring to? Regarding the fans on the radiator, there isn't a wrong way to mount them. Personally I have mine setup in the exhaust position so that they blow the hot air out of the top of the case. You can set them up as intakes but you might experience slightly higher case temperatures. Overall though, its whatever you prefer. When I said "damage" I was metaphorically speaking about my rushed decision to buy this case and now not being able to return it. I also got the Seidon 240M as you suggested and the CM V700 PSU, but some troubles appeared while assembling the components. So at first I wanted to install an optical drive, one hotswap sata rack and a fan controller/card reader as drives. But when I removed the three drive bay covers I discovered that only two are operational as the third was blocked by a fan. I proceeded by removing the fan controller out of my setup. As I was finishing and struggled very hard for hours to organize the cables in the pretty tight space on the right side and the holes, I left the seidon 240m to mount at the end. Well now it seems that a 240 water cooling cannot fit at the top. First the problem seemed like it was the DVD-ROM. It had to be removed from the very top drive bay so the 240 can slide in place where the screw holes are. Which leaves me with only one drive bay available. Ok, I decided to swallow that bitter pill and move on. And just when I thought MAYBE I could do without a dvd-rom and removed it, turns out the 240 STILL cannot fit because my motherboard has a radiator (not very big btw) right at the top which prevents the 240 radiator to slide down in it's place. Well this does it for me! I give up with this case! I was very excited about my new rig and started buying components which I thought were high class without thinking about how much I'm gonna spend. I wanted to make the perfect workstation, starting with the Cooler Master Cosmos SE case as one of the top of the line. Well my excitement died in the process. Cosmos SE managed to turn every bit of enthusiasm that I had at the beginning into disappointment. It's terrible and I want to return it at every cost. Everything is so tightly done that even a surgeon cannot get his way through inside. Nothing of this model is "Cosmos-like" or cooler master like! It's just another ordinary steel box which is being marketed as "full-tower" . Nothing more! Patrick, you personally suggested to install a 240 water cooling and you guaranteed that it will fit on top. I went and ordered the Seidon 240M and now I'm left with a water cooling which I probably won't use because there is no space to fit, and with a terrible case which I'm not happy with at all. The only place left for the water cooling now is the front which will require the sacrifice of removing all those drive bays. That is totally out of the question because I plan to install 3+ hard drives and I also want them to be easily accessible. I cannot believe I fell for this marketing trap. This totally ruined my opinion about Cooler Master. I was very prepared to listen to your advice, but now everything turned out into an even bigger mess. I have everything very well documented, the whole process with pictures and videos. My initial intention was to publish a nice and quality review/guide while enjoying in the process. But this turned out a nightmare. I REALLY hate writing bad reviews, but I sure won't spare my words on this one. A look from the inside. Those two points are what prevents the water cooling fitting in. Patrick I'm very disappointed by your suggestion here. I was going to get a 120m water cooling, but you personally convinced me that the 240m is going to work just fine in Cosmos SE as exhaust and as a Cooler Master representative here I totally went for your suggestion blindfolded. Well this doesn't seem the case at all. Now I can't return neither of the Cooler Master products back to my supplier. I'm stuck and I needed this PC workstation done for yesterday. I feel tricked and I have no clue on how to proceed. I apologize. I was not trying to give you a bad suggestion as it does state on our website that the Cosmos SE will support a top mounted 240mm radiator. 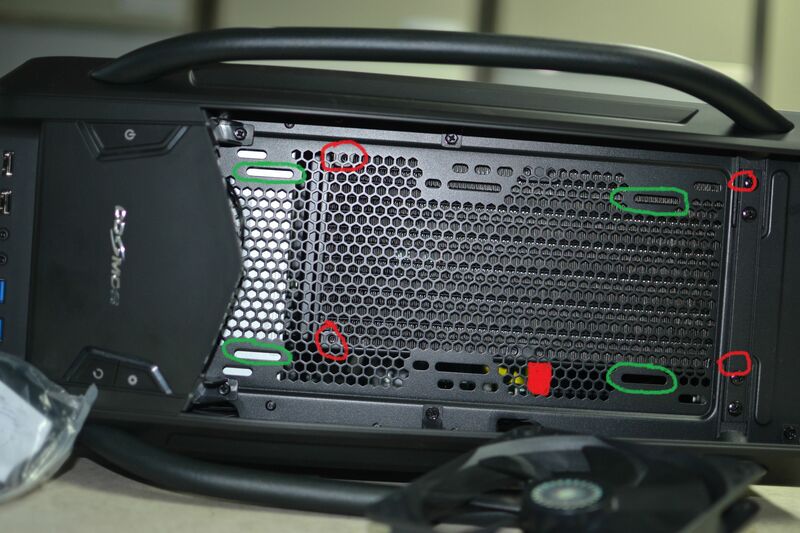 Due to the size of the case, the fans will need to be installed at the top of the case in between the chassis and the plastic top cover. This will fix the issue with the fans making contact with the VRM heatsink at the top of your motherboard. You will also need to install the optical drive in the lower drive bay since it will not fit in the top bay with the radiator installed. We do have PDF’s instructions that I can send you if you need help with the installation. The preferred position of the fans for a top position is exhaust on the bottom side of the radiator, even you mentioned that it is better and suggested that. I am really not comfortable putting them above the radiator as I planned to install other two fans there in a push-pull configuration. This is a BIG design FAIL for this case and I still feel tricked for listening for your advice and getting the seidon 240m. And as far as the DVD-rom is concerned, I'm aware that I can put it in the lower drive bay, but this leaves me with ONLY ONE drive available left from the initial three that I thought existed by looking at this case. Another BIG DESIGN FAIL for this case. These two reasons alone made me hate this new case I was so excited about and I was so eagerly waiting for. Not to mention the other cable holes flaws. My motherboard is covering half of the holes for the cables which makes it very inconvenient for not only organizing cables, but also damaging them. The sata cables and main power cable from the PSU are bent so bad that I think they will break any moment. I really don't like this case and it's design. But the main reason is the 240 not fitting in like it should. If I knew that the ONLY way to fit a 240 water cooling on the top is to set it in an intake position, I would have returned the case while it was untouched. Now I cannot return the Cosms SE back and I'm stuck with it. Not satisfied with this answer. I wrote to the Cooler Master support about this and see if there's any way to resolve this. I'm very frustrated and I'm already loosing working hours because of this incident here. 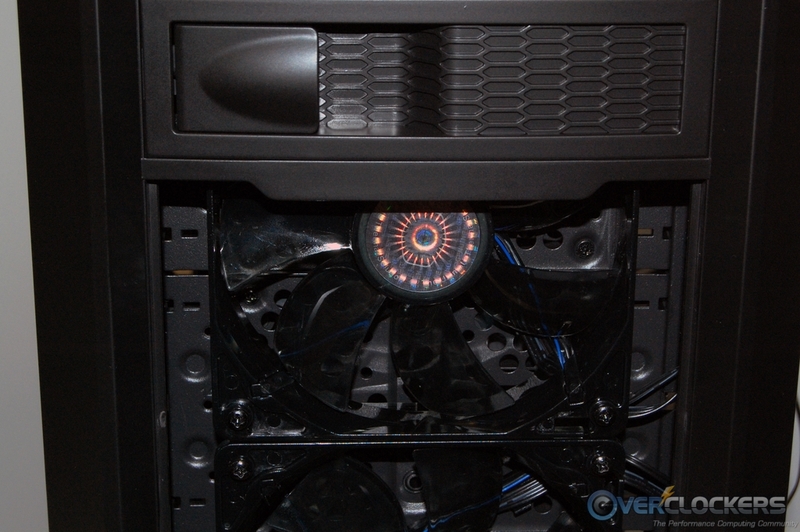 You can still install the fans in the exhaust position at the top of the case. You will need to flip them over so that they are in a Pull orientation this way the fans pull air through the radiator and out the top of the case. Due to the size of the case you will not be able to install a Push/Pull setup as there is not enough room for this in the case. Would anything prevent you using all 3 optical bays? I want to buy the case and put two front fans, two hdd cage fans, one rear fan and the eisberg 240l prestige. Would anything prevent that? ive been using cosmos se more than 3 months and im still using it right now.. never planned to change it to other case.. cosmos se actually can provide you tons of flexibility.. u just really need to understand its components and parts.. and a little bit creative.. well the pict proved everything..
Just for the record it IS possible to set push-pull in a cosmos SE case. Its just going to depend on how much clearance the motherboard installed has from the top of the case, what fans & AIO/Radiator are used and if you have a DVD drive (or something that takes as much space) in the top 5.25 bay. I currently have a h100i installed in a push-pull setup using Corsair SP120's on a Asus Sabertooth 7ZZ motherboard without any installation problems in this case. I understand that it may work for your current setup but due to the amount of motherboards available and differences in heights of the VRM heatsinks, its possible that certain customer will have trouble installing a push/pull setup. This is why we do not recommend this to customers. How did you fit the fan in front of the GPUs? Hey guys, i know this is somewhat of an old thread but i recently bought a bunch of quiet fans with white led's to install two in the front, and two in the top. I simply took some pliers and bend away the little rim sticking out on the bottom of the front fan plate mount. it allows you to move both fans down, so that you aren't covering any 5.25 bays. Hope this helps!! Do you have pictures of what you did? I'm not quite sure what you mean. Thanks! how much CFM and mmH2O do i need for radiator fans? Will a 240mm radiator fit in my corsair spec-02?